This is the basic, it is really simple. 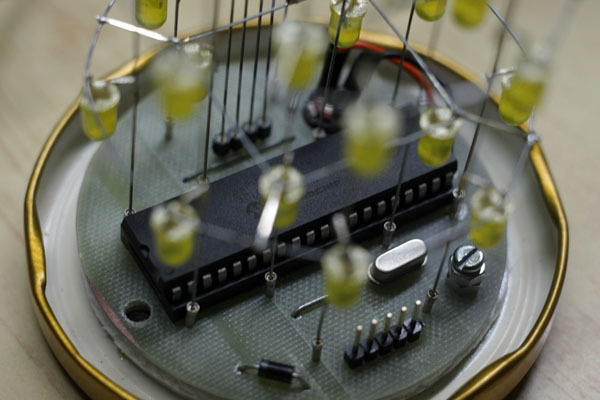 We use the MCU to drive the leds directly. I thought of using a 74HC595s, but it will be an overkill for this project. 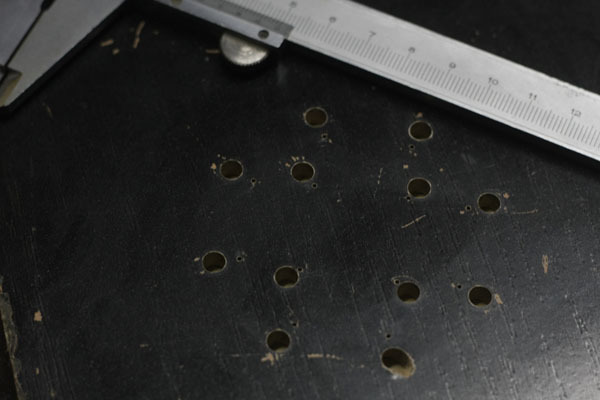 So we have 12 LEDs per level (8 in the outer ring and 4 in the inner square). We'll use the common anode matrix mode, so we need 12 channels - one for each column, and 4 channels for the levels. Ok, we'll source current to the leds directly from the MCU, and ground each level via one of the ULN2003 channels. 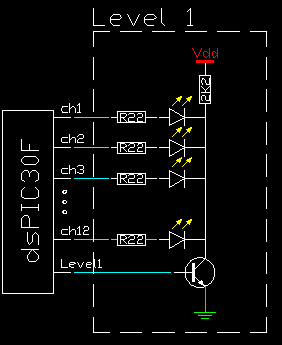 The MCU - dsPIC30F3014 is a 5V chip, capable of sourcing about 200mA current (25mA per pin). 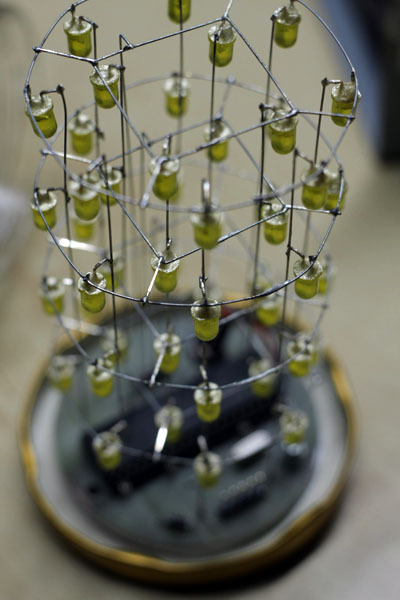 We'll put some resistors before the leds (22 Ohms). If you make the calculation this will give you just above 100mA per led(channel). Of cource, this wouldn't be good if we source the current continuously to one and the same leds (I doubt if even in this setup the current would kill you leds, as each pin will source no more than 25mA, and this is just right for a led, but anyway we don't want to push our MCU that hard), but we are switching the levels really fast, so the avarage current/voltage will be much less. So this resistors are there to give you a minimum protection (in normal operation conditions, they are not needed, as we control the voltage by PWM). This was for the led channels, now for the levels. Each level is controlled by one of the channels of a ULN2003, it is capable of grounding 500mA per channel, so this is more than enough. We interface the ULN2003 directly using another 4 pins on the MCU. OK, I don't know what to say more, this is really really simple project. 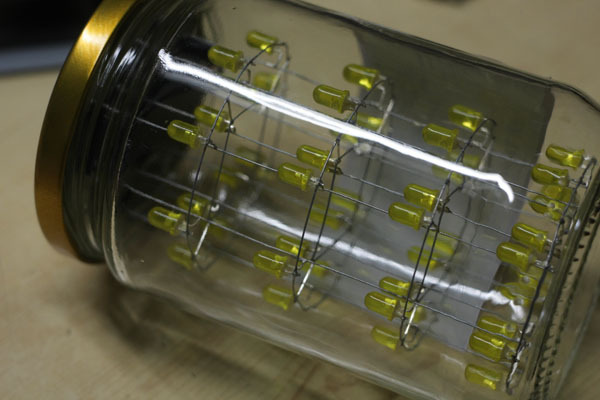 The challange is to build the led matrix, and figure out how to attach the PCB in the jar cap. The software is a stripped version of the 3D LED RGB CUBE code, as we don't have the USB/UART communication, we don't have RGB effects, no audio analysis, but only the very basic features. The fun part is the construction and finding a jar with a fancy form. As this is very basic project, I made the PCB with my router, one of the reasons is that the PCB should be round (to fit in the cap). 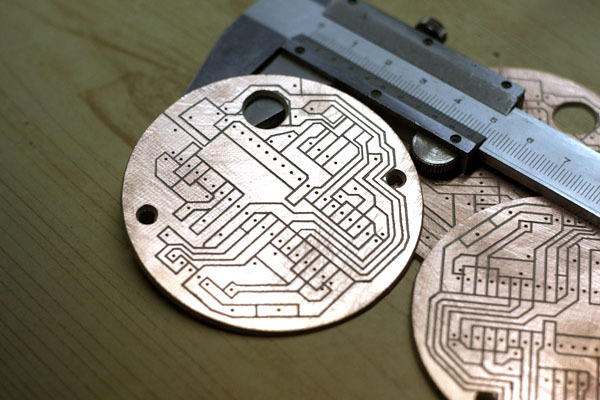 So this schematic for PCB is optimized for routing, not for etching. 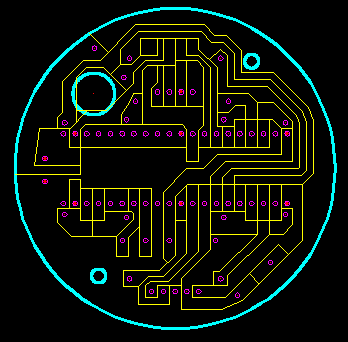 The yellow lines, are the routing paths, separating each line, the cyan is the cutting path (to make some openings in the board, for the screws and for the 2,1mm power connector). For power supply I use a 5V AC-DC adapter, you can buy it from ebay or your local electronics shop for about $3-5. Here are the wiring diagram and the additional elements used. There are some 0805 capacitors and some 1206 resistors, one shotky diode, the MCU DIP40 socket, one 7,5MHz crystal and the ULN2003 (SMD). 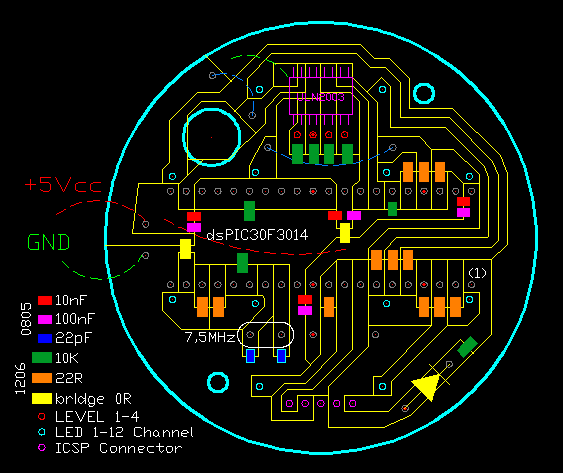 OK, this is the PCB just after the routing. It is single sided. This is what the device is looking like in the end. (this is the first prototype, I'll paint the PCBs black on the next bLAMPs. This is the jig I'm using to make the matrix. Here're the LED matrix and the whole thing ready. 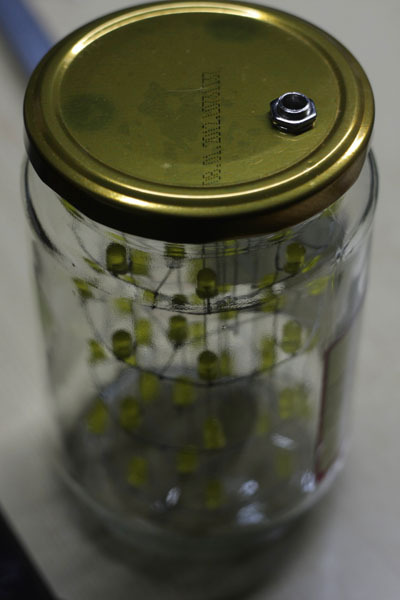 So, this is the bLAMP - a jar with a LED matrix in it. All you need is a AC-DC 5V adapter to power it up.